Advertising will sometimes try to sell a movie as the funniest of the year . . . during the third week in January. I think that’s a fairly short-sighted marketing approach, but maybe people don’t remember that eleven more months will doubtlessly have contenders to the self-proclaimed title. Why even bring it up? Because I want to explain my take on this RPG. I’m not going to call this the coolest RPG I read in 2010 . . . yet. This is what I’m considering to be my Eclipse Phase for this year, the game that just grabbed my throat until I tapped out admiration for it on my keyboard. There are other shadowy games just off the horizon that could be more, but right now this is the game I’m watching. The game in question is Hoodoo Blues (Vajra Enterprises, 312 Pages), which takes a look at the rich myth and history of the American South. The layout of Hoodoo Blues looks great on-screen or printed (I personally will not read 312 pages on a monitor). A mix of whites, blacks, and grays makes the large undertaking a little less Herculean. The upper borders contain a mix of images – gris-gris, candles, and pictures – that are accurate enough, but not particularly interesting. The mesh of images along the outer border is much more intriguing and creative. The sidebars are set apart in a non-distracting way; however, they lack the pizzazz some others possess. Black text with white background means it is the core text; Black text on gray background establishes a sidebar. It’s a perfectly fine way to go about things, it’s just not the most artistic. There are many asides throughout this book, which I believe to be necessary. Some of the asides are blurbs of the upcoming sections. The authors realized they were dropping a massive amount of information into the minds of would-be game masters and players, so they established many one-page or one paragraph explanations throughout the book. Just reading these will still be a decent undertaking because you’ll want to read more; however, this set-up does create the sole possibility of making this a pick-up game (and that’s through a sheer stretch of the imagination). I’ll talk more about this game in a one-shot versus campaign mode later. We won’t dwell here. What readers get out of the introduction is a one-page “in brief” of the game. This details the key factors of the game’s setting and system. There is also a brief bit of flash fiction, a quick discussion on the book’s language, and two notes about historical, social, religious accuracy and sensitivity to the material within the book. The introduction wastes precious little space before shuffling into . . . 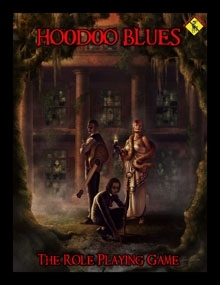 Character creation in Hoodoo Blues is a nine-step process that is mostly familiar. Come up with a concept (step one), divide points among attributes (step three), and so forth. A few novel steps do exist such as decide on your character’s primary musical tastes (step two). The idea behind the musical step is to aid developing your character. A great deal can be said about a person by their playlist. While the options are a little limited (punk is mentioned whereas rap isn’t until much later in the book), there are enough choices for most groups. Besides, it is easy enough to go beyond the book for musical choices. Step six allows the players (who are immortals of one kind or another) to detail what they were primarily motivated by during each decade of their existence. I’ve seen a few games that use a concept like this; however, it’s usually something devoted players opt to do on their own. There are eight Attributes which are given scores from a pool of 80 points. A 1 is feeble while a 20 marks the other end of the spectrum. Other factors such as Class, Advantages, and Disadvantages may affect those totals. Skills come from a pool of 100 points and contain enough options to guarantee a variety of characters with differing skill sets. Advantages cannot be gained until there are Disadvantages to pay for them. This is mostly familiar ground with some interesting flavor mixed into it. The Classes available in the game are one of those differences. Vampires are not one of the immortal races available. No, these creatures are Hags, Voodoo practitioners, the deal-making Crossroaders, and more. One final note on character creation goes to the treatment of XP. Gaining and spending XP work as usual in games; however, Hoodoo Blues also offers ways to lose XP. Failing horribly at goals, making the world a worse place, or splitting up the party for reasons that hurts the party are the three ways detailed to lose XP (also players cannot go into negative scores on their XP). First, I love the idea of losing XP, but I’m not enthralled with the three means of doing so. For me, splitting up the party usually affects the game for everyone involved. People feel left out. Attentions waiver and chaos emerges. I am for this application of losing XP and would have liked to see more reasons like this detailed. The other two generally are learning experiences on their own and shouldn’t take away from one XP. Getting defeated actually works as a good motivator. The nuts and bolts of this system is right here: Roll attribute + d20 vs. difficulty. From this simple mechanic, the authors are free to get much more creative. The first bit of inspiration is “chance rolls” versus “deliberate rolls.” Before I go into them, let’s talk about our good friend the botch. Botches are those funny little guys at the table who can really make players squirm, especially in the middle of a fight. Botches are sometimes strange, though; they show up at odd times when you really don’t expect them – times when players would have warded them off successfully. Well, these two rolls deal with these kinds of botches. “Chance rolls” are always made at sudden instances, such as a fight, the sudden need to protect a computer from a hacker, and so forth. These rolls have automatic failures when a one is rolled and an automatic success when a twenty is rolled. “Deliberate rolls” are rolls made for a controlled minor surgery, hacking into someone’s computer, and so on. These rolls never have automatic failures or successes (once the two characters on both end of the computer/hacker equation start working against each other, it becomes an opposed action). Skills have ranks in the game (one through six), but offer bonuses. A skill that a person could attempt to mimic by attribute alone (brawling) offers a +3 bonus per level. A skill that cannot be attempted by someone without that knowledge grants a +4 bonus. These bonuses are required to make the impossible “difficulty 40″ level less impossible. The remainder of this chapter focuses on detailing Attributes and skills, how to handle combat, and Flashback play (immortals have long stories to tell). Readers are treated to just under a hundred pages of Southern American history, society, and more. The authors managed to offer a detailed, meaningful history while keeping it interesting enough for a game book. My love for history may have created a little bias for me; nevertheless, I feel like the end result is successful. This chapter is a little oddly named as it is also where game masters and nosy players will find monster stats (and there are so many odd additions within this book), discussion of the “thin places,” and, oh yeah, two adventures. The “thin places” are an interesting concept involving “almost” time travel. It works like this: sometimes something important happens that just sticks to the place almost like a haunting. Years and years afterward, there exists the possibility that people can fall into that moment again as it is always occurring. Perhaps the player falls into a “thin place” where an old enemy doesn’t have their powers yet. They opt to kill them on the spot. Once they return, nothing has changed. If the player had gone back to get information from that version of their enemy, they could bring that back with them (though the enemy would never remember giving it to them). The entities are fully functional versions of those people up to and at that particular moment the “thin place” is created. Could be quite useful. The threats in the book are a great mix of new and old (much like the whole book). Heck, even the lowly mermaid proves a little dangerous in this book! This section is full of cheat sheets for Southern terms and slang, game terms, and game master or player aids. These twenty-plus pages are probably pound-for-pound the most needed within the book. I like the look of the character sheet. It’s spacious for all the notes you’ll have to make about your burnt-out immortal. Thanks to Vajra Enterprises for providing a free reviewer’s copy of this interesting game.